Tokyo, Japan – August 9, 2017 — Noble Master Games announces Demise of Nations, a simultaneously executed turn-based grand strategy wargame. 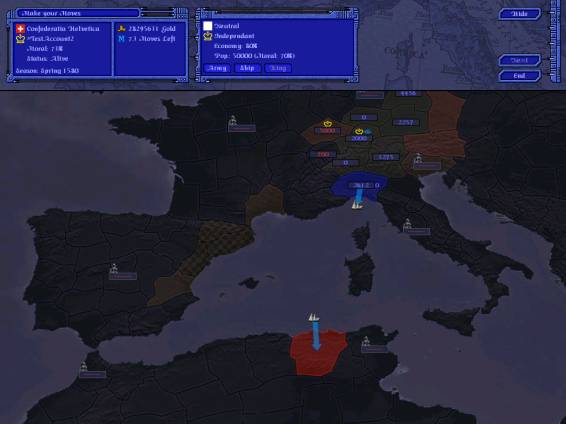 The game covers the rise of Rome till the fall of modern civilization. It’s a mix between Civilization and “Unity of Command” featuring deep game-play including diplomacy, research, building, trading and resource management. 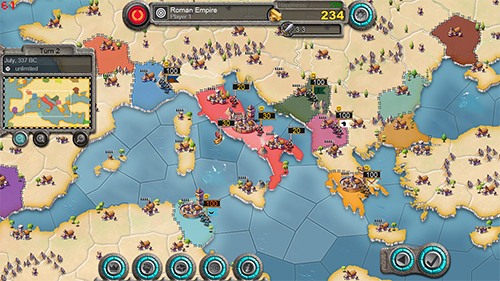 A player commands his armies in one of the many ancient to modern countries including the Roman Empire, the Greeks, Carthage, Sparta, Britain and the United States. From Rome to Celtic nations, one creates his own warring experience, wages colossal wars solo, against the AI, or takes on gaming friends in multiplayer games. 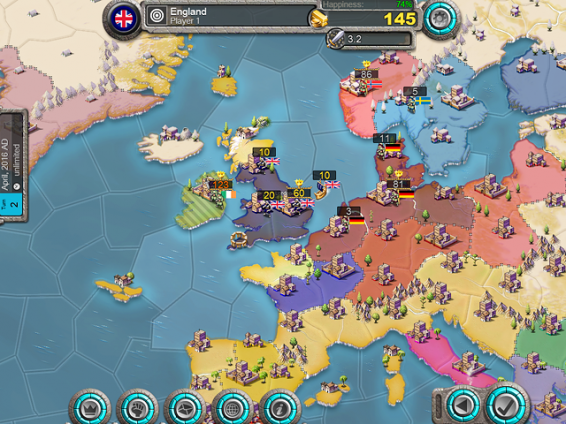 One can form alliances and fight co-op style with the AI and other players for ultimate victory. The game supports cross-platform multiplayer matches against players on PC, Mac, Linux, Android and iOS. Turn-Based Grand Strategy covering Ancient to Modern Times. 4X Strategy: eXplore, eXpand, eXploit, and eXterminate. Diplomacy, Research, Trading and City-Building. Maps including Ancient and Modern Europe, the Pacific or the world. Challenging AI for single player. Cross-platform multiplayer & hotseat including co-op games. Modding support with integrated map editor. High scores, playing statistics, achievements and rankings. The dev. team is a global affair, with contributors from Tokyo, London, Ohio, Boston, St. Petersburg (Florida), Switzerland and South Africa. The artist on the project, Tony Hager, a 2D/3D artist has worked alongside Nick Lee and Dan Malone from the Bitmap Brothers. He is a veteran of the 2D-era and previous titles include Sims 2, The Incredible Hulk and Transformers mobile. Sean Beason (EA) brings his industry experience to provide professional music scores to games. Dr. Holger Mauch helped draft the AI for the game. Demise of Nations is available in the English language (other languages in the works). The game can be downloaded directly from the official website or via Steam (PC/Mac/Linux), Google Play (Android) and iTunes (iOS). 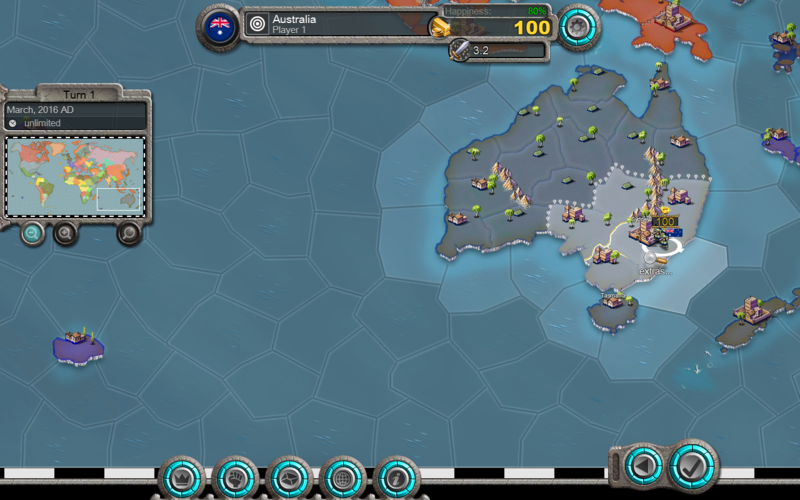 Demise of Nations comes with two maps provided for free. Additional maps can be downloaded for USD 3.99+ a piece or USD 19.99 for all. Multiplayer games are free to join. However, to cover server costs, there is a fee for custom online game setup or custom avatars. Demise of Nations is not pay-2-win. For additional information on Demise of Nations such as press kit and promo codes contact Christoph Aschwanden. Noble Master is an indie game company with focus on real-time and turn-based strategy games for desktop and mobile devices. We are currently running a trial with ad-based monetizing of the in-game chat. 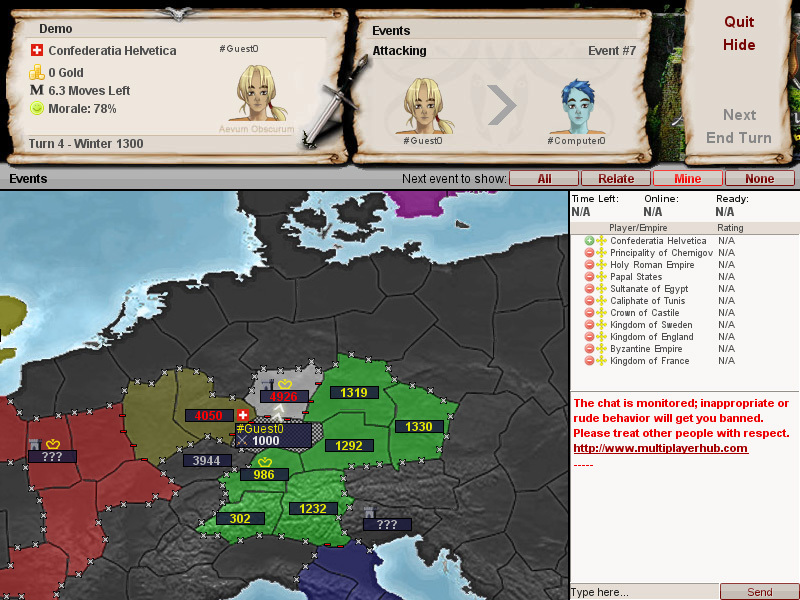 The experiment will run for 24h and is available in both our games Age of Conquest IV and Demise of Nations. Whats your favorite ad (#1-#8)? What’s your most disliked ad (#1-#8)? Do you have suggestion for improvements? Other consumer information you’d like to see? Daikon Media have created a review for Age of Conquest IV. Age of Conquest IV is a keeper – a game of sustaining long-term motivation, that will remain on your phone until you sell, lose or break it. Starting October 1, we will hold our 1. 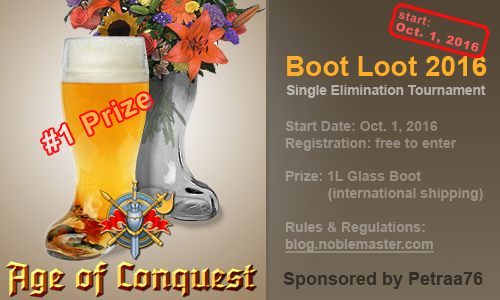 Boot Loot Competition giving out a 1 Liter Glass Boot to the tournament winner. The tournament is open and FREE to enter for everyone. The competition is played as single elimination tournament. Players are seeded based on their rating. Matches are played with a maximum of 32 players per game. The top player of each game advances to the next round. The prize is given out to the winner of the final round. The glass boot will have a custom engraving reflecting the tournament victory. A shipping address will have to be provided by the winner of the competition. We will do international shipping. The tournament prize is sponsored by Petrikov Alexander (Petraa76). We thank him for his generous donation! Open the Longhaul room (daily turns). Join the Boot Loot 2016 competition (via Join a Game). Setup: 24h/turn, WEGO-Fast, 40 turns max. per game. By signing up, you agree to the tournament setup as stated above (subject to change). Badmouthing other players in the tournament, including the eventual tournament winner, will get your account banned or disabled. If you don’t agree with the setup (we are the ones that set it up, not the players), don’t participate. Game rules and regulations as available in the game’s manual (Help & Info section) are in effect unless stated otherwise. Players that are found cheating, will be barred from winning the prize. Using multiple accounts is not permitted. Multiple people using the same device is not permitted. Contact the moderators team if you are living in a household sharing a single internet connection with other members that also participate in the tournament. The moderators team will make the final decision if you are allowed to participate or not. Participating without prior consent will get your account(s) disabled. The moderators’ decision cannot be challenged. The tournament is currently limited to a maximum of 10000 players. If the tournament is full, we will either (a) add another tournament leg or (b) start the tournament early. If there is a tie for 1. place in the final game, we will decide who will win the prize. If there is a tie for 1. place during qualification and elimination rounds, the system will place the player that is listed first in the standings table into the next round. If we are experiencing technical problems or there is cheating going on, it is possible that some players will get a (slight) disadvantage. The tournament will not be altered for those players and the tournament will go on as if nothing had happened. Recourse will not be granted. Please enter your actions early if you can. For more serious problems, we reserve the right to re-setup the tournament and start from the beginning (or somewhere in-between). The tournament winner has to provide a valid shipping address for delivery of the prize, a 1L Glass Boot. Failure to do so will make the prize go to the 2. place finisher and so on. If no one in the final round was willing or able to provide a valid shipping address, we will decided what to do with the prize. Please note, although we do international delivery, we cannot guarantee to ship to every single corner of the world. It might not be possible to ship the prize to war zones or remote locations such as Antarctica. Also, we cannot guarantee to have it arrive in one piece, although it should be properly packaged. If it is covered by shipping insurance, we will organize re-delivery. Both shipping costs and import tax will be pre-paid by us so you will receive the prize for free (unless import taxes cannot be covered by us). Players that are not permitted to participate and/or receive the price, due to law and regulations in their location of residence, are excluded from the competition. Also, make sure to follow the minimum age requirements before downloading and playing the game. Questions will be officially answered in the comment section below only. If you encounter technical problems, post your problem(s) in the official forums. If you encounter bad language or believe some players are cheating, use the [Report] button in the game to notify the moderators team. Please supply screenshots and proper proof in writing. We reserve the right to ignore insufficient reports. Providing false reports can get your account closed. Rules are subject to change. Please note, we will do all in our power to keep the tournament fair for everyone participating. However, it is possible that we have to change the rules in order to do so. By signing up to the tournament, you agree to the rules as stated above. Any recourse to courts of law is excluded. 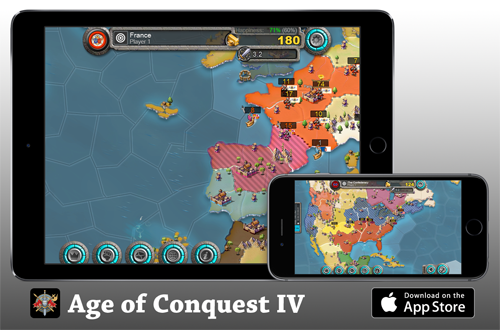 After much delay, Age of Conquest IV for is now also available on iPhone, iPad & iPod. Please visit the App Store for details. The game requires iOS 9.0+ and amd64 or higher to run. Age of Conquest IV comes with two maps provided for free. Additional maps can be downloaded for USD 3.99+ a piece or USD 19.99 for all. For a detailed description please refer to our original Age of Conquest IV Press Release (links are provided for press, promo codes etc). Tokyo, Japan – April 6, 2016 — Noble Master Games releases Age of Conquest IV, a simultaneously executed turn-based grand strategy wargame. It is a mix between “Risk” and “Total War” including diplomacy, messaging and governing. The goal of the game is expansion and eventual victory by taking over the world. In addition, similar to Chess, each nation needs to make sure to keep their king safe from enemy capture or the game is over. 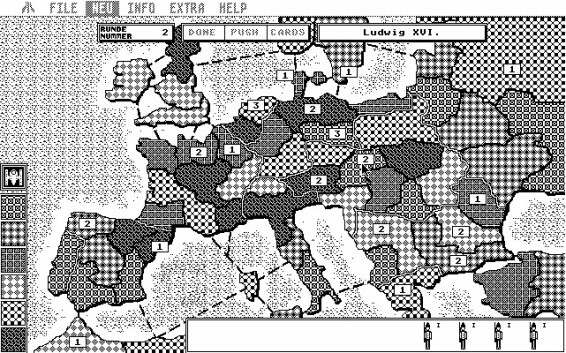 A player commands his armies in one of the many ancient to modern countries including the Roman Empire, the Greeks, Carthage, Sparta, Britain and the United States. From Rome to Celtic nations, one creates his own warring experience, wages colossal wars solo, against the AI, or takes on gaming friends in multiplayer games. 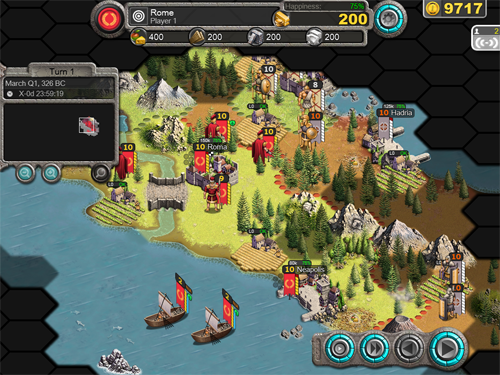 One can form alliances and fight co-op style with the AI and other players for ultimate victory. The game supports cross-platform multiplayer matches against players on PC, Mac, Linux, Android and iOS (pending approval). 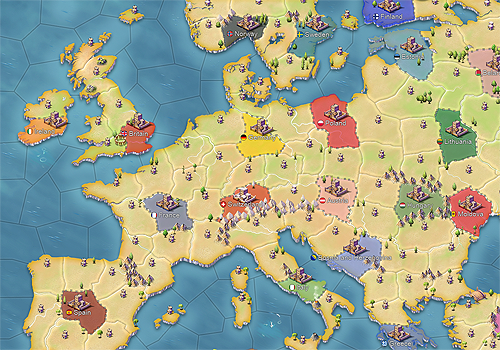 Turn-based grand strategy wargame with maps & nations from all over the world. Challenging AI for single player games based on a genetic algorithm. Cross-platform multiplayer & hotseat-play including co-op team games. Map scenarios including Europe, Colonization, Asian Empires, American Wars, World Conquest and more. Map editor and a central server to host and distribute player-modded maps. Hundreds of factions including the Roman Empire, Carthage, Persia, Celts and Inca amongst others. High scores, playing statistics, achievements and multiplayer ELO-ranking. 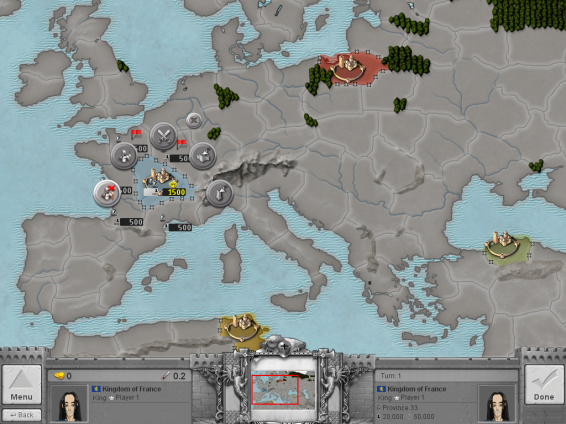 Age of Conquest IV is available in the English language (other languages in the works). The game can be downloaded directly from the official website or via Steam (PC/Mac/Linux), Google Play (Android) and iTunes (iOS; pending approval). Age of Conquest IV comes with two maps provided for free. Additional maps can be downloaded for USD 3.99+ a piece or USD 19.99 for all. For additional information on Age of Conquest IV such as press kit and promo codes contact Christoph Aschwanden. 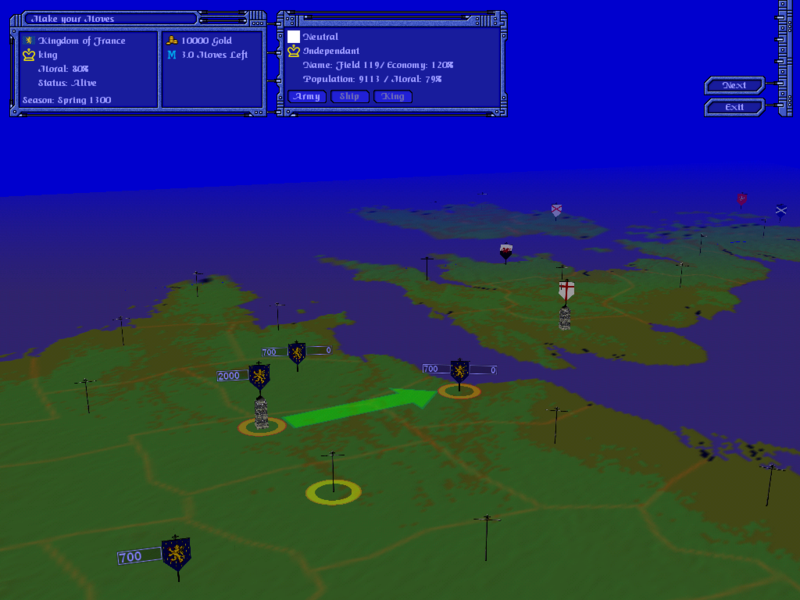 Age of Conquest has been originally released on May 17, 2000. The game has gone to numerous revisions over time. Below a screenshots depicting the various changes. Not sure if this belongs here, but probably the very first implementation started with “Emperor”, a single player game for Atari ST. 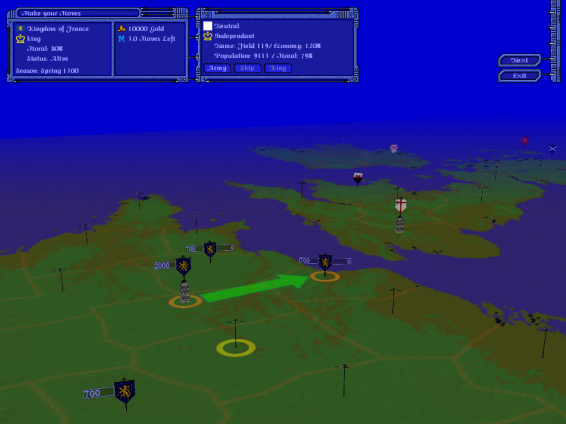 The first installment of the game was released under the name Aevum Obscurum (Dark Ages) and supported ONLINE-play only across PC, Mac & Linux. Release data was May 17, 2000. An experimental version of Aevum Obscurum II was produced but never released. The next installment of Aevum Obscurum went live going back to 2D-maps. 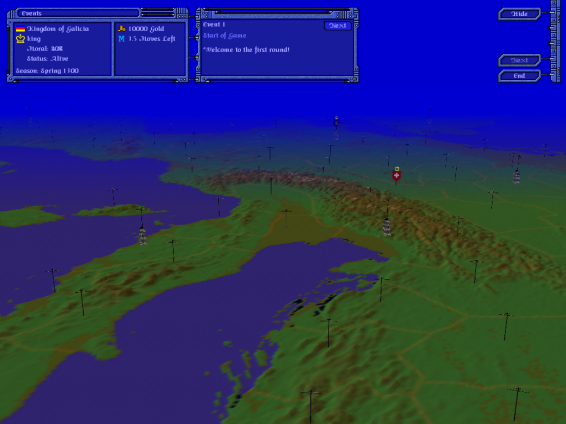 An updated version of Aevum Obscurum II was produced with improved graphics & player avatars. A resign and port to Android/iOS was implemented featuring much improved graphics. The name was changed to “Age of Conquest”. The latest release featuring single player and full cross-platform multiplayer game-play across PC, Mac, Linux, iOS & Android. With the latest update to Demise of Nations: Rome we brought forth many new units, as well as some graphical updates to existing units. These new units all offer much more varied stats than the previous iteration of units, so you may find it helpful to learn a bit more about them. Rome – Applies to Rome and Samnites. Carthage – Applies only to Carthage. Germania – Applies to Germania, Gauls, Celts, Iberians, Ligurians, Slavs, and Balts. Greek – Applies to Greece, Macedonia, Syracuse, Illyria, Thrace, Epirus, Athens, Corinth, Sparta, Messapia, Etruscan, Picentes, Lucania, and Sardinia. Persia – Applies to Persia and Egypt. Berber – Applies only to Berbers. Sarmatian – Applies only to Sarmatians. 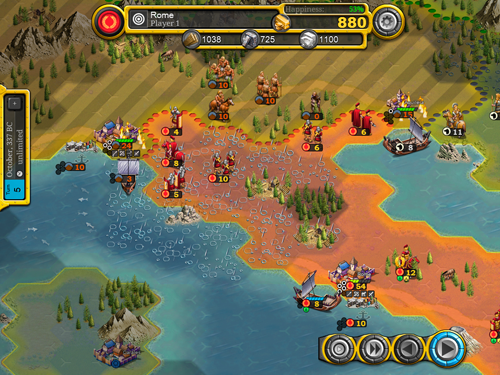 Generic – All nations can produce these units. Since the last update, Demise of Nations now features 30+ nation-specific troop types. 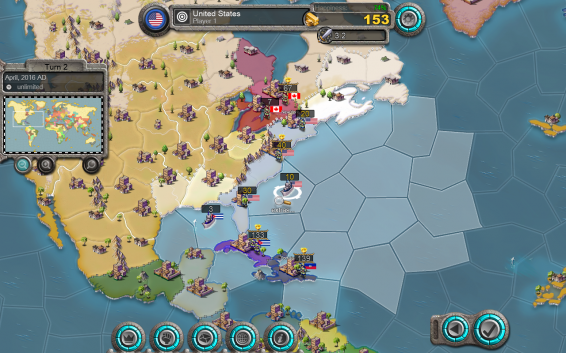 Also, the Pirates & Northern Expansion maps are now free to play. New troop types are among the following. Additional troops types are available for Greece (Athens, Corinth, Sparta, Macedonia, Syracuse, Illyria, Thrace, Epirus), Germania (Gaul, Celts, Iberians, Ligurans, Slavs, Balts), Berbers and Sarmations. The game is schedule for release in Q1/2016 on PC, Mac, Linux, Android & iOS. Please follow us on twitter for further updates.